Lynne Hull art: Twist (detail), (1993). Wood, 30 ft high. 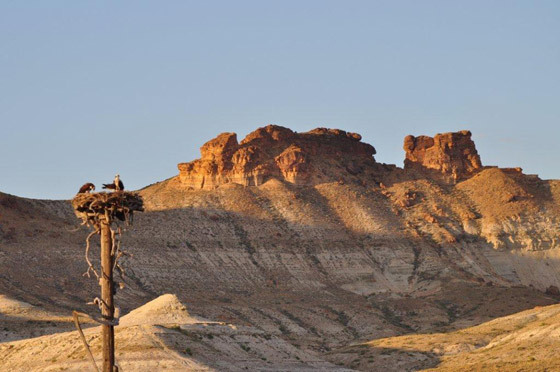 After many years, osprey have gradually moved down the Green River in Wyoming, discovered the sculpture Twist and built a nest on it. The image of three osprey on the nest indicates that two osprey mated and raised at least one young during summer 2011. “Raptor Roosts”, like the one pictured above, came early in my career. Wyoming is a great place to see hawks and eagles, as well as other wildlife. Friends suggested that raptors hunting on the flat plains would love to have a high place to sit, observe, and hunt for prey. Instead of being electrocuted by roosting on power line poles (it has happened a lot out here), what I had to offer would be safe. In my research on raptors, I couldn’t find anyone who knew anything about raptor color perception. So I decided that I’d put up two roosts: one painted intense colors from the local landscape, and another left natural, to find out whether the birds preferred one or the other. Along a road, I found a low draw (like a dry streambed on the prairie that drains rain flow) and decided to place one roost on each side of it. The occasional water in the draw grows more plants to feed small mammals, so raptors would like to hang out there. I began to realize my artworks were also science experiments. For several years, two friends living nearby, their other neighbors and I have observed these roosts. Sometimes I’ve seen a hawk on one of the roosts, and would slowly approach it to take photos. But when I got too close, the bird would usually lift off and fly to the other roost. My friend Nancy reported several times that she saw young eagles on the painted roost, so I speculated that hawks don’t mind color and eagles may prefer it. It is wildly exciting to see a hawk take off or land on the roost. One visitor had to sit down on the prairie, overwhelmed by tears. More than twenty years later, both roosts have weathered to grey wood, but both still stand out in the Wyoming wind, hosting birds. In a later project for osprey with the Wyoming Game and Fish Department along the Green River, I realized I was working to honor the species that I was trying to help by making an aesthetic object for their use. Even later, I came to think of my work as “eco-atonement”— atonements for the damage we humans persist in doing to them. My spiritual life is based in honoring nature. As of summer 2011, the Green River osprey sculpture has a family nesting on it. I imagine the moment when the couple were flying over the landscape and found Twist, their artwork, waiting for them.